The Indian Air Force (IAF) is now aiming to induct a total of 18 squadrons or 324 indigenously designed Tejas Light Combat Aircraft (LCA) over the next decade in an effort to boost its rapidly declining combat fleet. The single-engine Tejas has a tailless delta-wing configuration and supposedly costs only $25 million per airplane. The proposal for Mark 2 (Mk 2) version is getting finalized by IAF. "The Mark 2 will have qualities like the Gripen and Mirage fighters and will be called Medium Combat Aircraft instead of LCA," one of the officials said. State-owned defense manufacturer Hindustan Aeronautics Ltd is looking to significantly increase the involvement of private companies in manufacturing Tejas combat jets even as readies for an additional order for about 200 units of the latest Tejas model, government officials said. 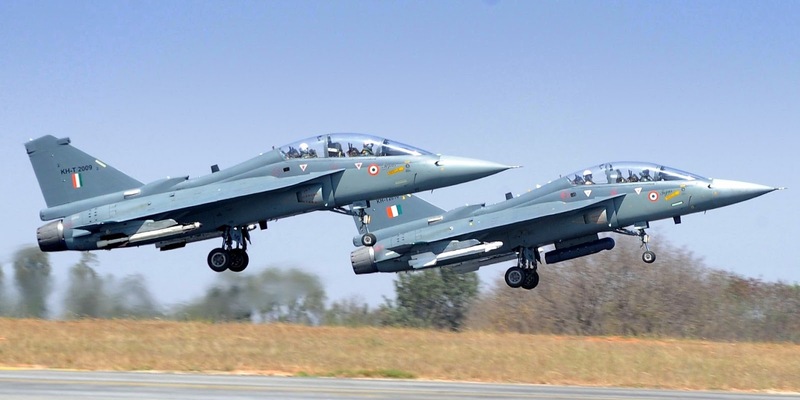 Hindustan Aeronautics Ltd (HAL) has already roped in private players including L&T to make key components for 123 Tejas Mark 1 and 1A light combat aircraft (LCAs) that it is building for Indian Air Force (IAF). HAL seeks to improve the Tejas Mark 1 by installing an Israeli EL/M-2052 Active Electronically Scanned Array (AESA) radar, jamming pods and an aerial refueling probe. This Tejas Mark 1A subvariant will make up the latter two-thirds of the Mark 1 production run. The advanced Mark 2 variant, which is being developed by HAL and the state-run Aeronautical Development Agency (ADA), will be fitted with the more powerful General Electric F414-GE-INS6 engine, which generates a thrust of 90-98 kN, to give the fighter greater maneuverability and a higher angle of attack. General Electric (GE) won a contract worth $822 million to supply this newer engine, for the Tejas’ projected Mark 2 derivative; the first two of 99 F414 engines on order reached India in 2017. Defence Research and Development Organization (DRDO) chief Dr. S. Christopher also confirmed that first Tejas Mark 2 will make its first flight by 2022 and will be ready to enter production by the time production run of 83 Mark 1A ordered by IAF comes to an end by 2025-26. Currently, the HAL is producing around 8 Tejas, a single engine multi-role aircraft, annually. With the private sector participation, HAL’s per year production capacity of Tejas is expected to scale up to 24, officials said. Out of 123 combat jets the company is making for IAF, 40 are Mark 1 version and the remaining 83 are Mark 1A version. In the case of the 83 Tejas Mark 1A jets, HAL intends to make use of L&T’s capabilities for making wings of the aircraft, while Dynamatic Technologies Ltd is expected to make the front fuselage, or main body, VEM Technologies the center fuselage and Alpha Doca would make the rear fuselage, officials said. "We have placed orders (for the 83 Tejas) with these firms, who will make the parts and if they are successful the parts will be integrated," one of the sources said. DRDO’s GTRE GTX-35VS Kaveri, an afterburning turbofan project originally intended to power production models of the HAL Tejas fighter. In 2008, The Kaveri was officially ‘de-linked’ from the development of the Tejas, given numerous delays and performance shortfalls and a fresh batch of F404 engines were ordered from GE. However, work on the Kaveri project still continues. So far, the Government of India (GoI) has spent ₹ 2,100 crore on the engine that has tested on the ground for over 3,000 hours and around 30 hours on an IL-76 transport plane in Russia. It has a marine variant that the Navy is testing and it is in talks with Bharat Heavy Electricals Ltd (BHEL) and the Indian Railways to power rail engines. Ten days before Macron’s visit, a French newspaper reported Safran was offering its M88 turbofan engine to India to revive the Kaveri project. The M88 powers the Rafale fighter, 36 of which are on order for India and which is at the center of another political storm. However, Snecma, as part of the offsets deal for the 36 Rafale jets India bought for its air force, is handholding the Gas Turbine and Research Establishment (GTRE), which has designed Kaveri, to fix gaps in its performance, address safety concerns, certify and fly it on a Tejas LCAs. The ₹ 600 odd crore expense for Snecma, which powers the Rafale jets, would be adjusted against the 50 percent offsets that it is mandated to spend in India. The partnership will also involve modifications on the Kaveri for a twin configuration on India’s AMCA fifth generation fighter concept and an altered non-reheat version for the Ghatak UCAV. At a time when companies are demanding high valuations for their initial public offerings (IPOs), HAL's valuations come across as rather modest. The company’s IPO is priced at less than 16 times earnings. It had aimed to raise ₹ 4,200 crore from its three-day offer that ended a week ago. By the time the offer closed, it had managed to raise only ₹ 4,088 crore as demand from non-institutional and retail investors remained muted. The Life Insurance Corporation of India bought more than two-thirds of the shares that were up for grabs in state-owned Hindustan Aeronautics Ltd.’s initial public offering. The government-owned insurer was allotted 2.34 crore shares, or about 7 percent stake, for Rs 2,844 crore, according to disclosures submitted to the stock exchange. That’s 70 percent of the IPO size. But that shouldn’t worry investors, said an analyst who did not want to be named. "Given the lumpy nature of the business where performance depends to a good extent on the delivery schedule of aircraft, it won’t be fair to evaluate HAL’s financials on a quarterly or half-yearly basis," added the analyst. Some brokerage firms have recommended investors to subscribe with a long-term view, which is a polite way of saying that they can’t expect decent returns anytime in the near future.